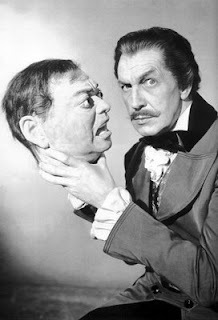 In 1960, Vincent Price starred in House of Usher for low-budget auteur Roger Corman, and the success of that project led American International Pictures to embark upon a series of gothic horrors adapted from the works of Edgar Allan Poe. 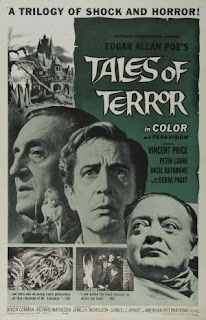 When it came time for the fourth Price/Corman/Poe collaboration, there was a need to freshen up the cocktail, so Tales of Terror was conceived as an anthology film, featuring a trilogy of stories from the morbid author. The first and last tales are fairly standard mixtures of blood, cobwebs, and melodrama; but the center story, “The Black Cat,” is overflowing with both wine and laughs. “The Black Cat” segment (actually based primarily on Poe’s “The Cask of Amontillado”) tells the story of Montresor Herringbone (Peter Lorre), an out-of-work lush who sponges off his wife (Joyce Jameson) to supply the money for his vino habit. After being tossed out of his regular watering hole, Herringbone stumbles upon a wine merchant’s convention, where a connoisseur, Fortunato Luchresi (Price), is about to display his unsurpassed wine tasting talents. Herringbone insists that he can out-taste any so-called expert, so he challenges Luchresi to a taste-off. The contest ends in a draw and an extremely pickled Herringbone, but things take a dark turn when Luchresi takes a liking to Herringbone’s wife. 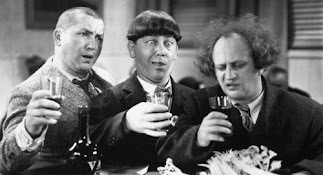 The wine drinking contest is the highlight of the film, due largely to Lorre’s ad-libs and Price’s fey mannerisms. Roger Corman brought in a real wine expert to demonstrate the proper tasting technique, and then allowed his stars to perform the scene as they saw fit. Price followed the expert’s technique step-by-step but exaggerated each gesture to hilarious effect. Lorre’s guzzling and improvised dialogue provided the perfect counterpoint. All in all, “The Black Cat” segment is a small gem, marred only by modern editing techniques which occasionally spoil the period feel of the piece. If you are looking for another wino film to complement Sideways (2004), give Tales of Terror a spin. Potent Quotables--MONTRESOR: Give me my money! ANNABEL: There is none, Montresor. You haven’t worked in 17 years. MONTRESOR: Will you--Has it been that long? Oh, stop your silly tactics. What about your sewing money? ANNABEL: We need that for food. MONTRESOR: Food--That’s exactly what I want it for. I drink my food. Similarly Sauced Cinema--Price, Lorre, and Jameson re-teamed for The Comedy of Terrors (1964), except that time around Price played the lush.